At Raising the Bar Media, we’ve spent more than two decades delivering the kind of customized content development services that help companies thrive. Whether it’s a website, blog, speech, brochure or video, we can help you communicate successfully with your customers, employees, and partners. We’ve done exactly that for a wide range of Fortune-500 and other companies in many industries throughout the world. Professional business writing gets you noticed. We have decades of successful experience helping clients deliver the right message to the right audience. 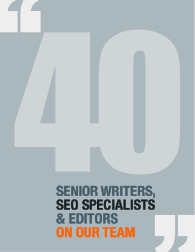 And with more than 40 senior writers, SEO specialists and editors on our team, we have the scalable resources to meet your needs. Professionally written articles, blogs, user documentation and social media are vital to grow a business presence and support your products or operations. Outsourcing your content creation to Raising the Bar Media guarantees you professional results without a wait or the expense of an in-house staff. Contact Raising the Bar Media today. Because quality matters.